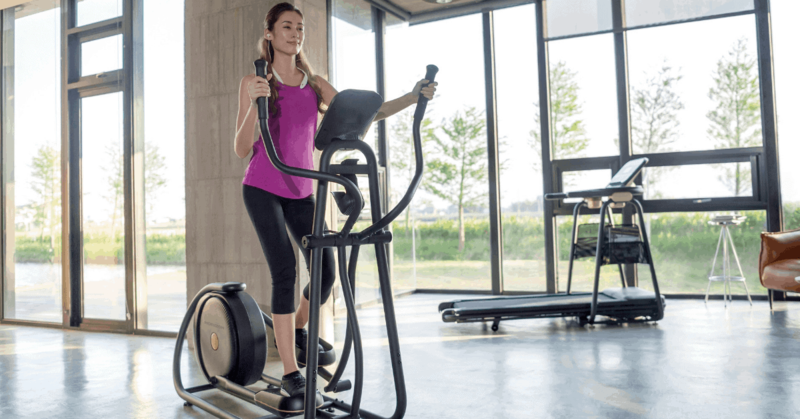 What are the benefits of an elliptical trainer for home use? The low impact of the elliptical allows you to enjoy a cardiovascular exercise that is easier on your joints than running on a treadmill. The exercise machine can provide a tough workout and is an excellent form of cardio. Try a tempo or interval training session for best results. A tough training session on the elliptical is also good to get your cardiovascular system into running shape. High intensity workout for walkers. Running on a treadmill burns the most amount of calories. But you can increase your calorie burn on an elliptical trainer by relying entirely on the mechanics of your body, rather than the machine, to hold your body upright and complete the movement is key to maximizing your calorie burn. But don’t fret if you’re not a runner! Elliptical workouts are a solid choice to increase the calorie burn of your workouts. If you keep your Rate of Perceived Exertion at a level similar to running on a treadmill, energy expenditure and oxygen consumption is similar as well. This means that you’ll get fitter and burn running level calories by mixing elliptical training into your weekly workouts.